With all that development going on up that way, there has to be a big increase in funds coming in... assuming assessors are doing their job right (which isn't always the case). Right now they're using the money to support the Knox Complete Streets project. The MATA extension would be the next logical project (assuming they re-up the district this year). The PID gets $300k a year for a quite small area. I believe the funds are coming from federal grants. Since the MATA has taken federal grant money, there have been a lot of changes in the business now that it is under federal mandates. But, as I am aware, the Knox Henderson is going to happen. Mm as far as I know, there hasn't been any money put towards an extension yet, I don't think? There was a request to NCTCOG earlier this year for $1mil for a study, but I don't know what the status of that is. tanzoak wrote: Right now they're using the money to support the Knox Complete Streets project. The MATA extension would be the next logical project (assuming they re-up the district this year). The PID gets $300k a year for a quite small area. Yes, both web sites report nearly $10 million for just 0.65 (2/3rds) mile extension. An extension loop to Knox up McKinney and down Cole will be at least 1.3 miles in length. DART and NCTCOG provided the local match for the FTA funding. Do you think DART would provide more when they'll be asked to fund the Knox-Henderson subway station for this MATA expansion to meet? tanzoak wrote: Mm as far as I know, there hasn't been any money put towards an extension yet, I don't think? There was a request to NCTCOG earlier this year for $1mil for a study, but I don't know what the status of that is. Yeah, that study was funded and all parties are in agreement that they will move the Knox extension along as funding can be gathered for it. MATA wants it, the city wants it and the NTCOG will contribute to its funding as well. Progress on ex-Toronto PCC #4614 per MATA's Facebook page. Does anyone know what happened to EMMA I have not seen her run in a long while. I vaguely recall hearing it had some electrical component fail a few months ago, can't remember where or when though. I'm just glad they're back to having enough operable cars to run three in regular service, instead of just two like they did for a while. 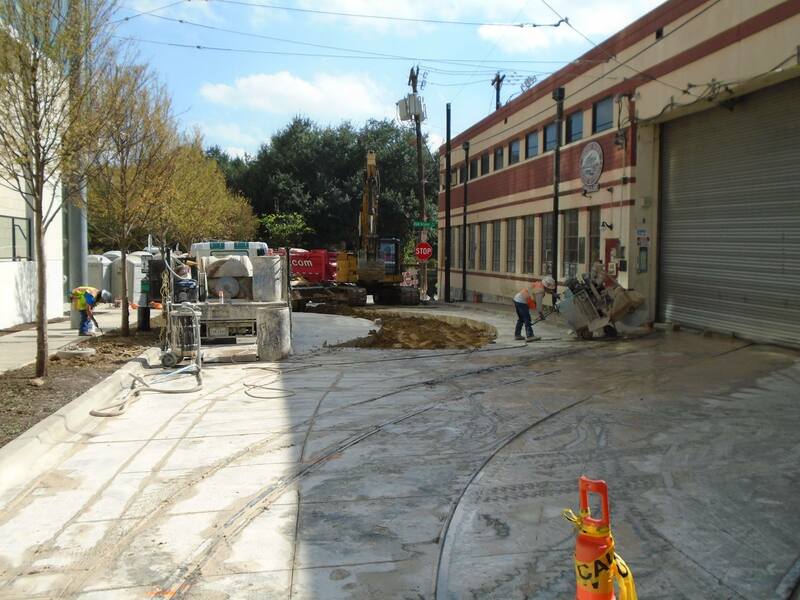 New track construction to connect new carban space in the M-Line tower. (Photo from MATA facebook). Cbdallas wrote: Does anyone know what happened to EMMA I have not seen her run in a long while. Emma's sitting in the barn. She often has trouble when she goes into service. Nothing has been done with her yet as workers are working on the ex Toronto car at the moment. northsouth wrote: I vaguely recall hearing it had some electrical component fail a few months ago, can't remember where or when though. I'm just glad they're back to having enough operable cars to run three in regular service, instead of just two like they did for a while. They will be running three cars by January. So far they have only been running two. Someone needs to make an identification card for the trolley cars. I've been on this forum since middle school and I still don't know the name of the streetcars matched with their appearance and or number. I think the only two I knew for a while was the Green Dragon and Rosie. The new MATA website has this page now but no pictures...http://mata.org/cars/ Emma isnt even listed on there and I would love to be able to follow things a little easier when they do a social media post about a car every now and then. Don't they have their names on them? Some do yes. If you google a few they show up like Rosie and the Green Dragon but since the names are pretty commonplace on the forum on this thread I would appreciate a cheat sheet for referencing when some of you go back and forth like everyone is in on the joke. Like what the name of the metal one the most contemporary one they have been using? I think it's from Belgium or something. Here’s their names with links to their photos. PCC from Toronto (Car 4614) Has it a name yet? As for wrappings, only the steel body cars have them that i'm aware of, and that leaves just Emma as being wrapped today. 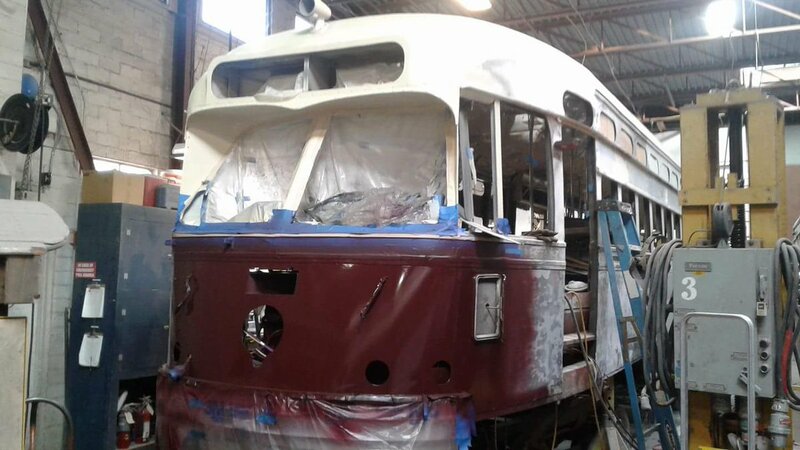 The PCC car will have a steel body, so it will probably get wrapped soon after it's running on the line. Vinyl wrappings don't stick to wood well, thankfully. electricron wrote: PCC from Toronto (Car 4614) Has it a name yet? From an old comment on the MATA Facebook page, " 612 will be named Margaret, after Margaret Crow, for Trammell Crow's gracious funding support in 612's rebuild." Seems likely to me that they'll transfer the name to 4614.
joshua.dodd wrote: So far they have only been running two. Huh, a few weeks ago I checked the tracker and they had three cars running. Oh well. Yeah, the third one was Emma. But she had a malfunction and has been in the barn. She should be running Friday. Can't wait to see here again and ride. I somehow never got to ride Emma never was in rotation when I was waiting at the stop. #4614 making its maiden voyage. Never thought I'd see the Toronto PCC restored. What's up with the extension to Knox? I wish modern street cars had better design. The PCC streetcars look so much better, I think because of the use of straight lines.. 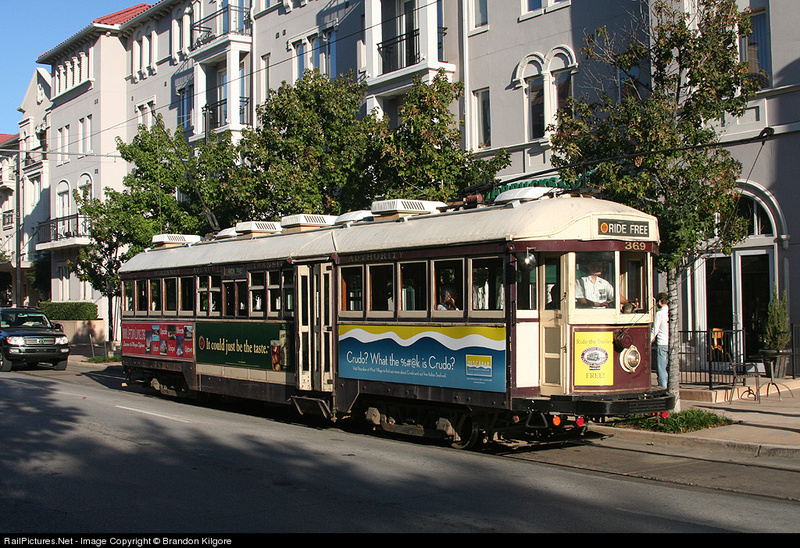 The modern streetcar in Dallas and in other cities, the Brookville Liberty model, look like Zingers Pastries. Supposedly the ride is smoother on these PCC cars and it looks like the capacity for connecting lots of rider to Klyde Warren will be a lot better considering ever since the park opened MATA ridership has increased. Posted on the Park District Facebook page, although I'm sure the photo came from MATA. I am digging those white sidewalls! Have not been inside yet but have seen it on the go and it is a beauty. We need more of these and the extension to Knox. Cbdallas wrote: Have not been inside yet but have seen it on the go and it is a beauty. We need more of these and the extension to Knox. 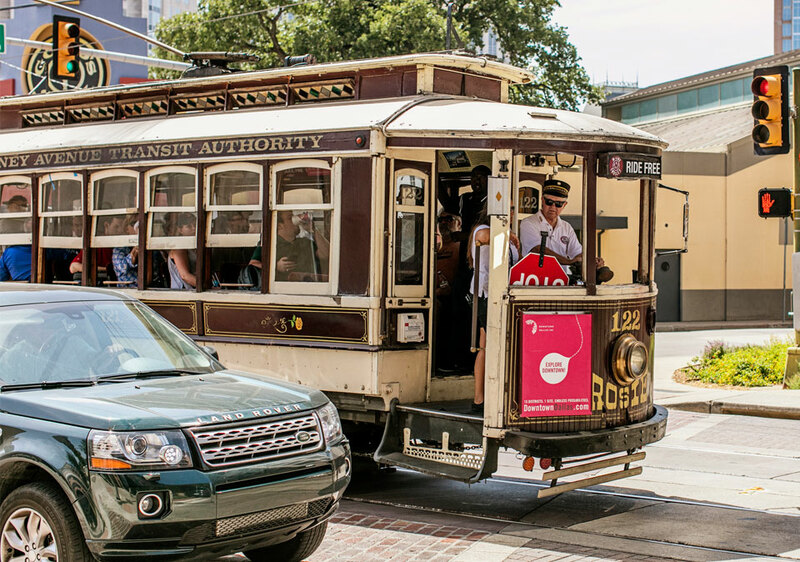 And need some double-ended cars painted in the Dallas PCC livery (like this one in San Francisco that I see nearly every day). My god... I've been waiting for this for soooo long. 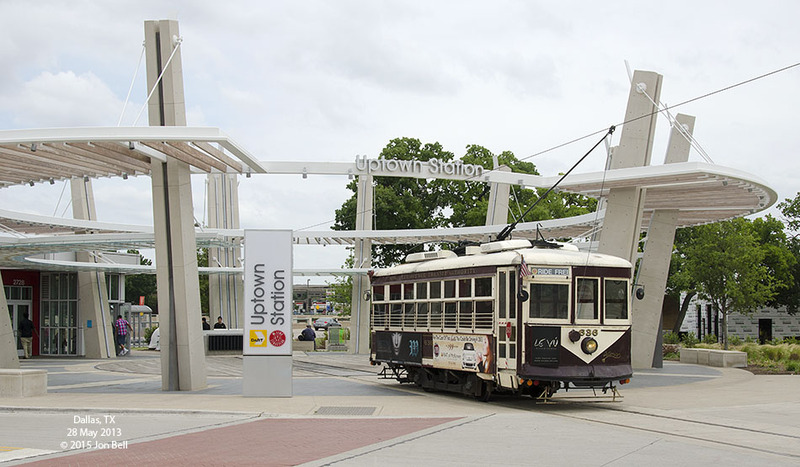 This makes me happier than D2... cotton belt, platform extensions, 3 car DART trains and the Modern streetcar combined. The only thing I'd get more excited about is the DAL-HOU Shinkansen. What is up with the Mats extension? Its probably tied in with delays on the Knox Complete street project. I think the Trolley extension would be a part of the conversion project of converting Cole and Mckinney to two-way streets which was only recently approved for some funding. Please though anyone feel free to correct me where I am wrong. Seen today. Wow, this thing is massive. I am loving this new car and the extra capacity it adds to the system. Hope to some day see this car cross Knox street with the expansion. These new old cars are great for making MATA a more useful transportation system for Uptown. The smaller cars were cute and a great love but these new old metal streetcars will add capacity and still hold the historical attractiveness that MATA has been able to capitalize on.